April 7, 2012: Includes an interview with Linda Ramone & Beach Boy David Marks! CLICK HERE for the web headquarters of David Marks! CLICK HERE for info about Johnny Ramone's book "Commando: the Autobiography of Johnny Ramone" ! P-Nut Butter What Am I Doing Here With You? CLICK HERE for a recent David Marks interview in Rolling Stone! CLICK HERE for the brand new Beach Boys recording! CLICK HERE to find out why you never say "no" to Panda! CLICK HERE for Celebrities and their vinyl! CLICK HERE for info on Marshall Crenshaw's EP Subscription Series!! 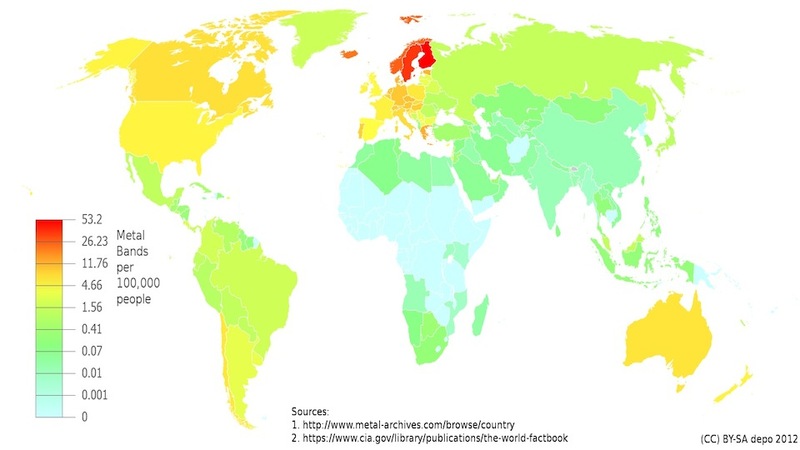 CLICK HERE to buy a copy of my friend Mardou's excellent new comic "The Sky in Stereo"
CLICK HERE for "LIFE Rides With the Hells Angels"
CLICK HERE for number of Metal bands per 100k people by country infographic. The Hits and the Great Interviews just keep on comin'! Been thinking of getting rid of Sirius/ XM it just hasnt been the same since the merger. I can also listen to WFMU in my car now. wow!! GREAT find, here. rod stewart is apparently just doing a scratch vocal that allows the basic rhythm track to get made...but, amazing - and inspiring!! if you are interviewing David Marks, live -- can u find out the scoop on just how many early songs hal blaine plays drums on, as he seems to say it is LESS than Hartamn intimates in Wrecking Crew. i am a HUUUGE Marks FAN! The Ramones: saving "oldies" from being old! Ive interviewed Davis twice previously - and I think I asked him that very question - I think he says "Our Car Club and maybe a few others"
oh yeah, i have heard both interviews you did, mike, and find them to be AWEsome with excellent raport. there just seems to be a discrepancy between what marks says and what hartman implies...at least in interviews..
pls ask David if that's Carl drumming on "Moon Dawg"
ha ha, sorry -- you are hearing from all the drummers about Dave Marks!! I have a relative, Randell Kirsch, that played with Jan and Dean and also has played with the Beach Boys. Has David crossed paths with him? what a GUY!! marks is ultimate CLASS!!! ALWAYS one of my idols!! We're with you, Michael. A #1 Hit is a #1 Hit. wait a second -- you mean these AIN'T really number ones?? i lost my subscription to Billboard, uh, when the top 40 started diverging from GOOD music. Billboard's not the only game in town anymore!